Hi everyone! 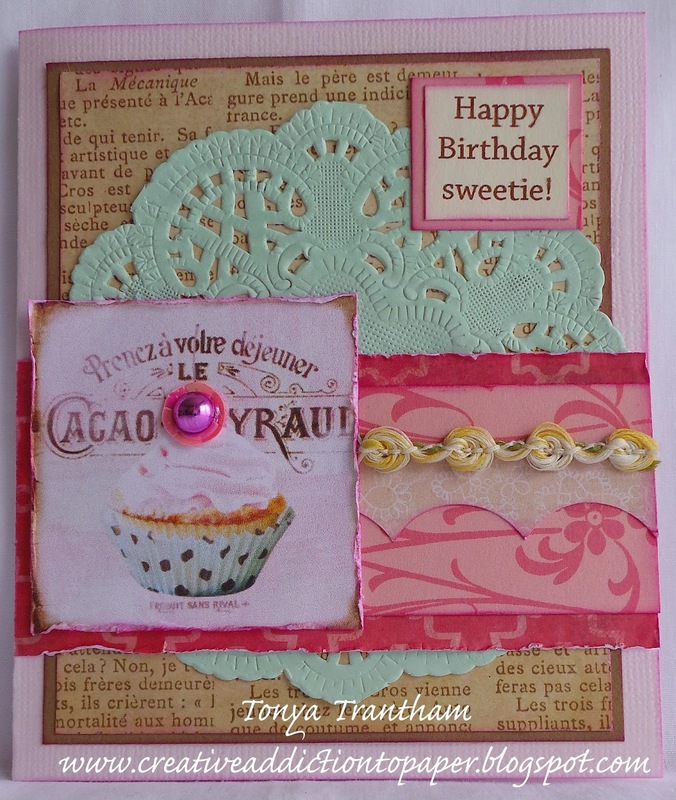 It’s me, Tonya and I am here to share my card I created for this month’s birthday theme challenge. I have been really into pastel colors lately and decided I would start with a pink piece of 8 1/2″ x 5″ which I folded in half to create the card base. I cut a piece kraft and printed cardstocks slightly smaller than the front and inked all the edges before adhering to the base of the card. Next I glued a mint green doily to the base along three scraps of patterned cardstock from my scrap stash and trim. The cupcake image is a printable that I sized up. I distressed the edges and inked. 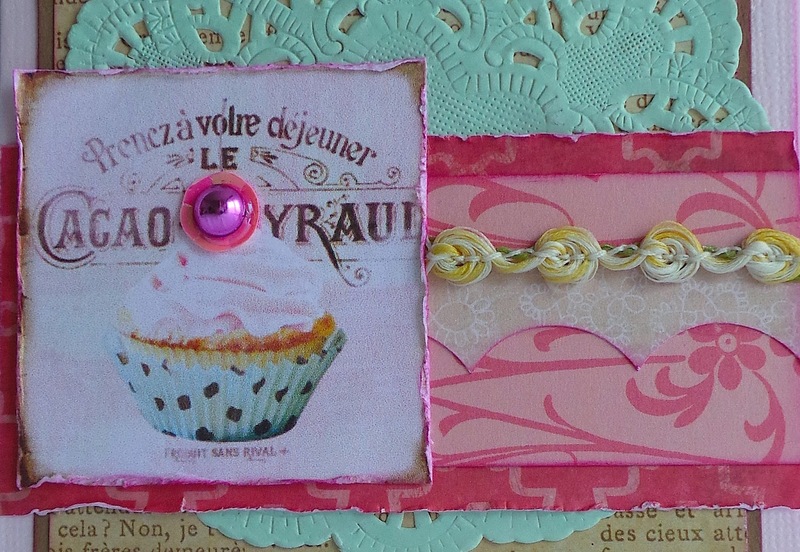 I added a sequin and a Dew Drop to the top of the cupcake and tada…finished! 🙂 If you have any questions about this card please let me know. Thanks for stopping by, hope your Friday is awesome and enjoy creating! Hi everyone! 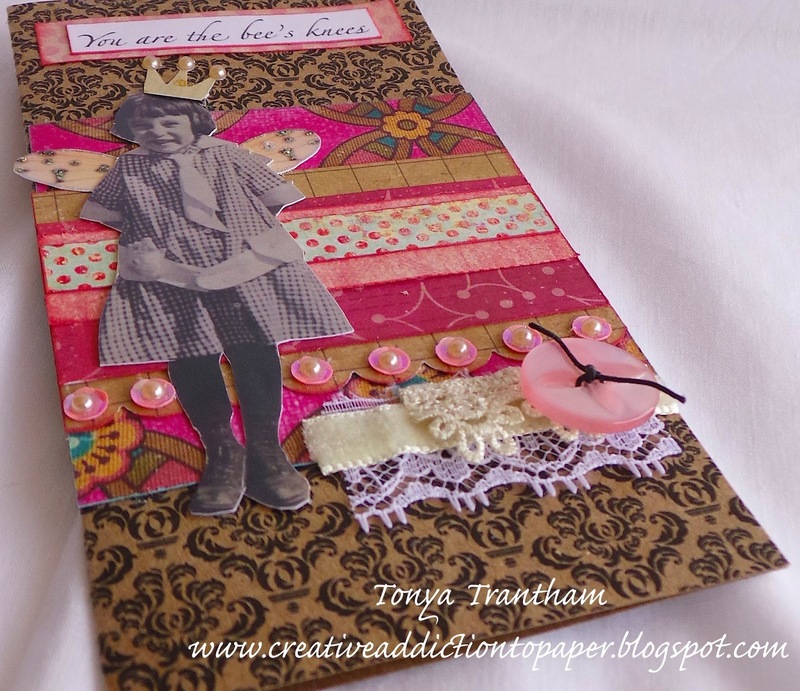 It’s me, Tonya and I am here to share a card for Crafty Card Gallery blog and this month’s theme is CHA inspired. 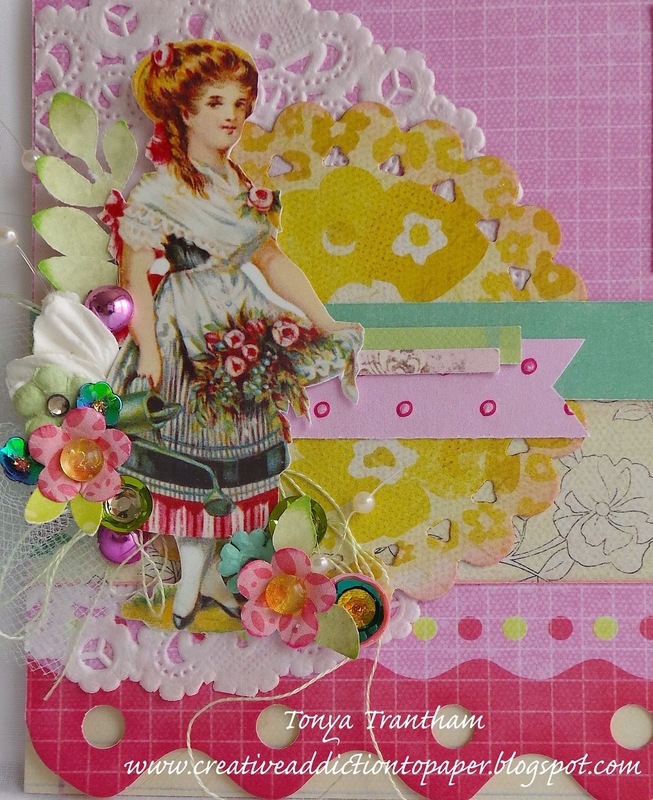 Since I had some of my projects in some of the booths at CHA and I had used digital images/vintage theme I chose to go that route with my card. I started with a 6″x6″ piece of cardstock from the Kraft and Black Cardstock Paper Pad which I folded in half…3″x6″…to create a card base. 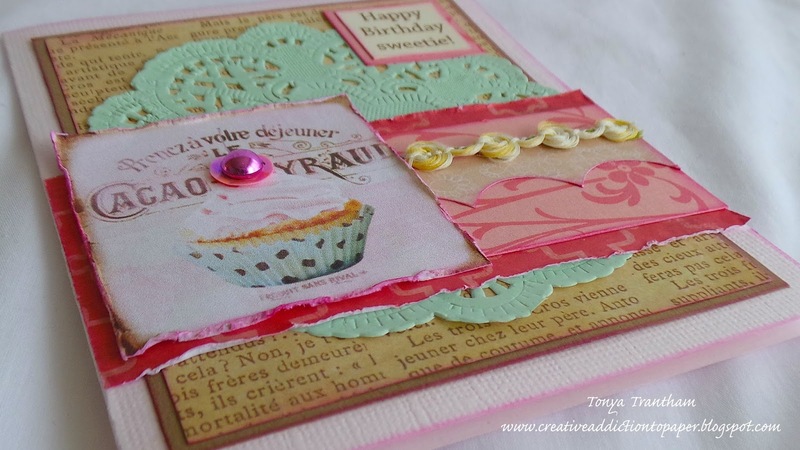 I gathered up scraps of patterned cardstock that had a vintage, pinkish, valentinish feel. Which I cut, punched and adhered to the front of the card. 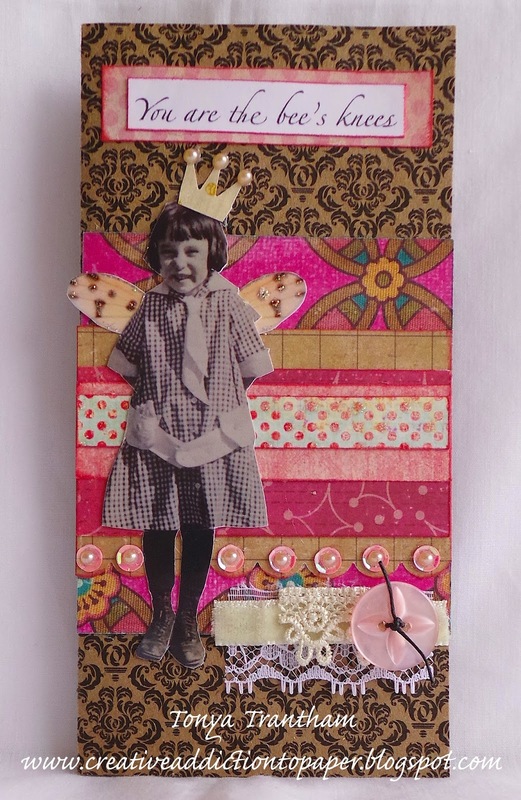 The girl image I found on Tammy Tutterow’s blog and best part it is free. I love the mischievous look on the little girl’s face. I sized the image down and fussy cut out. 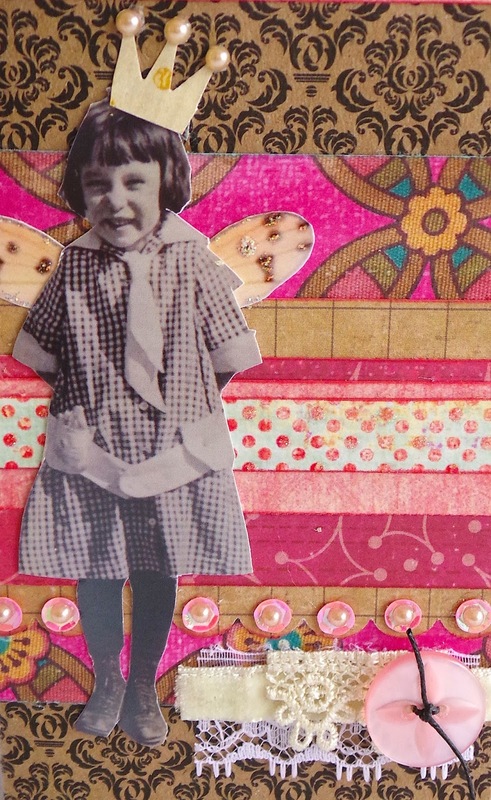 Next I printed out some butterfly wings that I purchased from Altered Pages and I fussy cut those out too. I adhered the wings to the back of the girl and then glued her to the card base. The wings I added a little Stickles to the wings and punched a crown out and glued to the little girl’s head. I also added flat back pearls to the crown. Thanks for stopping by, hope your Monday is awesome and enjoy creating!